The first thing to do when planning a trip to the Boundary Waters Canoe Area is to plan your entry point and route as soon as possible. This should be done several months in advance allowing you to reserve the desired entry permit. Some points only allow one access per day, so the earlier you decide the better. So, what should you consider when deciding where to go? This article was submitted by Chris Walden. Follow Chris, as he provides helpful tips and techniques for planning your BWCA Canoe trip. More great information to come! A few summers ago a friend invited me on on a trip to the Boundary Waters Canoe Area for a six night trip. I had not been camping in twenty years, and never in a wilderness setting like BWCA. Reluctantly, I agreed. Fortunately, I loved it! I’ve been there a few times since and am eagerly awaiting my next trip later this summer. Having a good plan is paramount to a successful trip. I’ve learned a lot about what to do (and not to do) while in the BWCA — some thing’s I wish I would have known before heading out. Having a good plan is paramount to a successful trip. In this series of articles I will to share some tips about wilderness camping. Articles will include how evaluating your group and planning a route. How to choose a canoe — including: materials, types of canoe, sizes, and just enough technical information to understand rocker and weight distribution and even a video about paddling basics and what do if you capsize. We will talk about tents, tarps, and other necessary equipment. I will discuss choosing a good campsite and how to pack enough food without having too much. With good plans and correct expectations — you can have great trip. A bad plan can ruin a vacation quickly. Fat Man’s Landing wants you to enjoy your wilderness adventure and we are here to help. Check back soon for the next article. Two Northerns On One Line? Erik Paulsen, U.S. Congressman and avid outdoor enthusiast, prepared the net. With Erik’s help we got some great action shots! 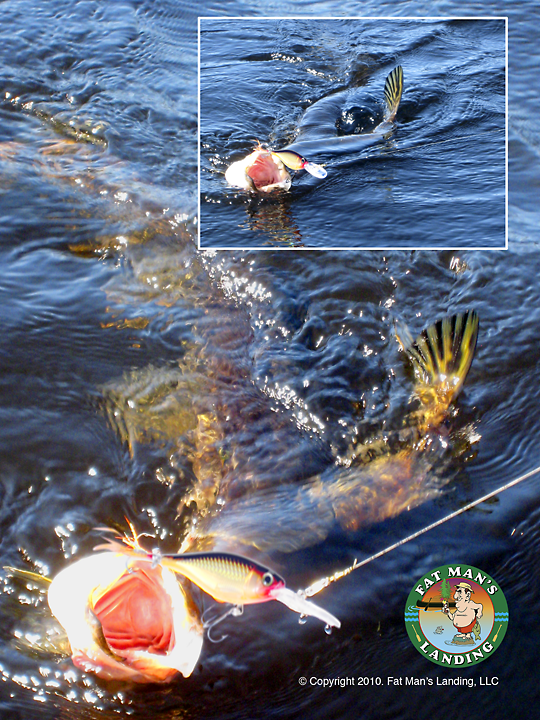 We’ve all seen pictures of large Northerns, but catching one trying to eat the other is an incredible sight! The big one we let go to fight another day.